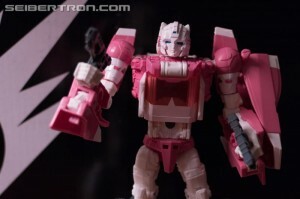 We've heard a fair amount about the new Arcee figure being offered as an early access Transformers exclusive (meaning it will also hit retail eventually) at Hascon, as part of the Titans Return toyline. The set also includes cards with tech specs, an Ultra Magnus diecast Titan Master (sporting the colour scheme of the original white Optimus cab), and the regular Arcee head Titan Master Daniel / Leinad. You can now check it all out in our in-hand gallery here at Seibertron.com! She looks bloody incredible and I need her. Wow Arcee looks good. I hope the quality of her plastic is as good as Blurr's. 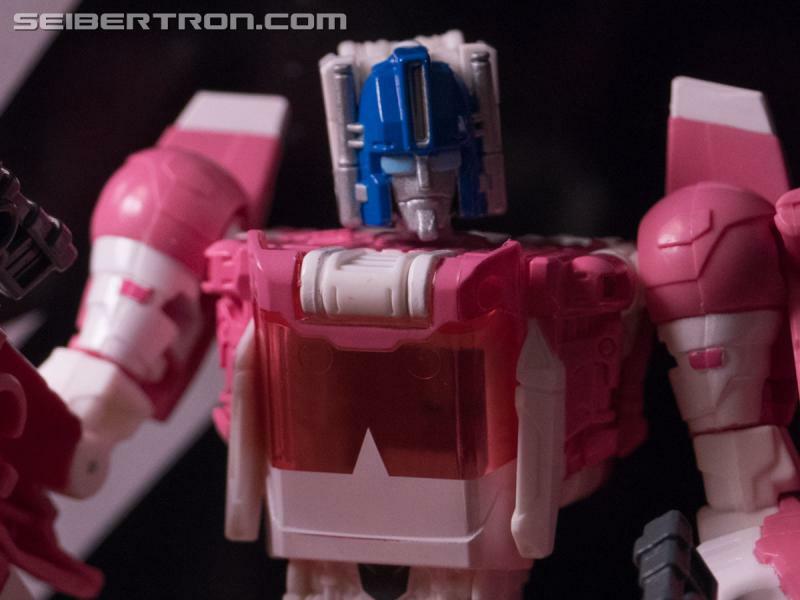 Is it me, or does Nautica fit this mold well enough but not so much for Arcee? It looks like a Great figure, but can we agree that Ultra Magnus' head does not go On Arcees Body, theres just something disturbing about that. Not bad, not bad at all. I'm really holding myself back from wanting her too much since I know there's basically zero chance of ever getting a hold of her where I am ("wider release" means nothing on my end if it's not full mass-retail), but boy is it hard not to NEED this so much. As an updated design for the classic 80s Arcee, she looks fantastic! Ultra Magnus is fine I guess, really not much to say here, it's Ultra Magnus' face on a Titan Master, coolio. And yeah Riddler, I know it's a bit of a late response now but I have a helluva time trying to keep my Octone's cab together. Eh, I can live with it since it's not too bad, but I suppose it is a little frustrating that it's so eager so split right down the middle. 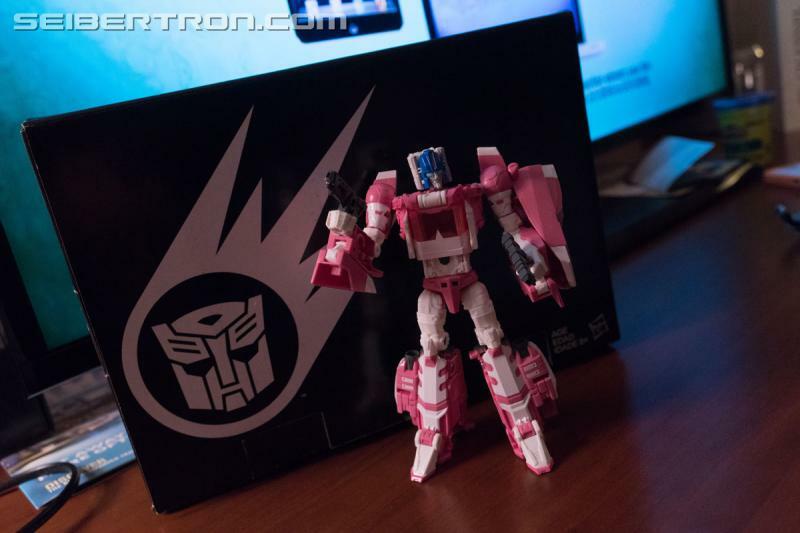 I really want it specially since I missed out on Generations Arcee,but either I want her. Quantum Surge wrote: Is it me, or does Nautica fit this mold well enough but not so much for Arcee? Va'al wrote: We've heard a fair amount about the new Arcee figure being offered as an early access Transformers exclusive (meaning it will also hit retail eventually) at Hascon, as part of the Titans Return toyline. The set also includes cards with tech specs, an Ultra Magnus diecast Titan Master (sporting the colour scheme of the original white Optimus cab), and the regular Arcee head Titan Master Daniel / Leinad. You can now check it all out in our in-hand gallery here at Seibertron.com! Hasbro, I need this now. Put it up for sale on your site!! Put it up for sale in the UK! Please! We never even got Wave 4! Kurona wrote: Put it up for sale in the UK! Please! We never even got Wave 4! That explains a lot. There's a grand total of 7 Smyths stores in the entirety of Scotland. So no more reveals? Prime, dinobots, and a Predaking teaser is all we get even after the leak? Hasbro really is in denial. The size of the crowd in the pannel video tells it all. I bet the only people not from rhode island who attended were major toy scalpers who bought like $2,000 worth of exclusives to flip. Rated X wrote: So no more reveals? Prime, dinobots, and a Predaking teaser is all we get even after the leak? There are more panels and a dinner/ceremony yet to come, so we'll have to be patient for any more news that may come later today, tonight, or tomorrow. Rated X wrote: I bet the only people not from rhode island who attended were major toy scalpers who bought like $2,000 worth of exclusives to flip. Joke's on them then, the sets will be available at general retail some time after the show. Me, I just want that die-casty Titan Master goodness. *drools* Hope they find a venue for Scorponok to complete the set of 4. In case anyone was wondering, Leinad's name was officially pronounced at yesterday's panel as "Lee-əh-nad". Is it true that the Takara Tomy Devastator combiner is better then the Hasbro Version released under Titans Return? I heard that the Takara Version has the anime painted hands, articulated elbows, and side movement joints, along with a more G-1 Accurate paint scheme?? I want a devastator, but is there a reissue for him coming soon that I should be looking out for, or spend the funds and get the Takara Tomy ver.? skywarp-2 wrote: Is it true that the Takara Tomy Devastator combiner is better then the Hasbro Version released under Titans Return? I heard that the Takara Version has the anime painted hands, articulated elbows, and side movement joints, along with a more G-1 Accurate paint scheme?? I want a devastator, but is there a reissue for him coming soon that I should be looking out for, or spend the funds and get the Takara Tomy ver.? As long as you dont mind devastator being bigger than the rest of your combiners takara is the way to go. I snubbed that mold for scale reasons, but my friend has both and takara is way better. I staying with TFC hercules with some add ons to make him more G1 accurate. Combiner Wars, not Titans Return. Mold-wise, the TakaraTomy Unite Warriors one is the superior one for the reasons you stated, plus that set comes with individual weapons for the members and the head has a retractable visor to recreate the two character models used in the cartoon. No reissues from either side I'm afraid, so get one while the getting's good!